Wyndham Grand Xi'an South is situated at the key position of the prestigious tourism site ‘Great Tang All Day Mall’ in Xi'an, just minutes away from Dayan Pagoda, international shopping centers, business pedestrian street and many famous historic heritage sites. The hotel is only 5 minutes driving from Xi'an International Conference Center and Qu Jiang International Conference & Exhibition Center. 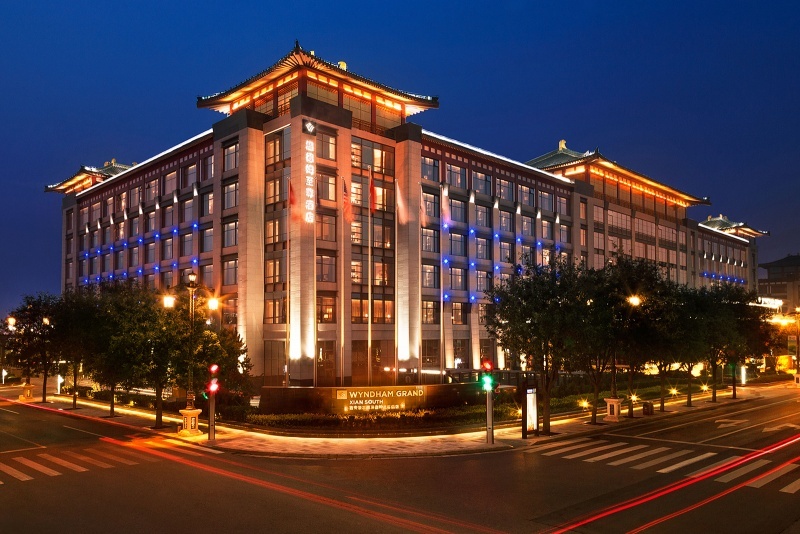 Wyndham Grand is the top brand of the Wyndham family, and Wyndham Grand Xi'an South is the first luxury hotel under direct management of Wyndham Group in China. Apart from the ideal location, Wyndham Grand Xi'an South is designed with both contemporary style and traditional Chinese architectural influence. 565 spacious, elegant and comfortable guest rooms and suites. The hotel brings 5-star dining experiences to a high level of creativity, presenting cuisines from around the world, as well as local favorites at the astonishing restaurants and bars. The hotel also provides an elegant setting for hosting high-level meetings and upscale private events. The versatility of our meeting and function rooms makes event planning an enjoyable experience at Wyndham Grand Xi'an South.